Little Mistress London Ladies New with tags, Gold Sparkly Shoes, High Heels (4 inches) UK Size 6 /39. Upper is made from faux suede leather and is very soft. Only selling as I can't wear heels anymore. Dispatched with Royal Mail 2nd Class. Beautiful black satin shoes with a gold stiletto high heel, suitable for dressy occasions such as evening wear or parties. 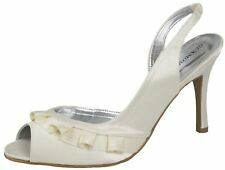 New listingDorothy Perkins Silver Heeled Sandals. UK Size 5. Dorothy Perkins Silver Heeled Sandals. UK Size 5. Scholl gel inserted included. Condition is Used. Dispatched with Royal Mail 2nd Class. Great pair of leopard print high heels. 5” killer heels 😬. Uk 6, Eu 39.